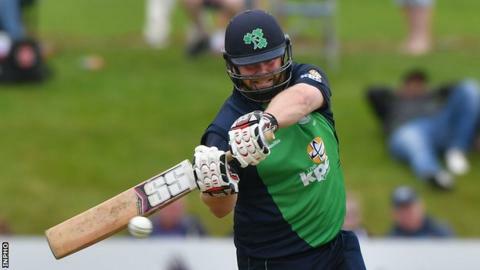 Ireland were bowled out for a 148 in reply, with Kevin O'Brien scoring 41 and Paul Stirling 40. JP Duminy was the pick of the bowlers with 4-16. Ireland will face Australia at the same venue on Tuesday. South Africa will then face the Australians in five one-day internationals, starting at Centurion on Friday. Ireland were without experienced batsman Niall O'Brien, who slipped in his hotel bathroom on Sunday morning and suffered a head injury. The South African team included three new caps. Bavuma, established as a middle-order batsman in the Test side, was given his chance as an opener in the absence of Hashim Amla. All-rounders Andile Phehlukwayo and Dwaine Pretorius were newcomers to international cricket. Ireland captain William Porterfield's decision to put the South Africans in to bat did not pay off as Bavuma and de Kock put on an opening partnership of 159. Bavuma, who was dropped on one when he edged Peter Chase to Kevin O'Brien at second slip, took advantage of the let-off with a composed innings, reaching his 50 off 54 balls and his century off 110 deliveries. He was out 13 balls later after hitting 13 fours and a six. Later, JP Duminy and Farhaan Behardien both hit rapid half-centuries to take South Africa to a total that always looked likely to be well beyond Ireland's reach. On a slow pitch, South Africa struggled to increase their scoring rate in the middle overs. Duminy (52 not out) and Behardien (50) gave the innings impetus with a fifth-wicket stand of 87 off 40 balls. Their partnership ended when Behardien was caught on the boundary off the last ball of the innings. Porterfield was out to Kagiso Rabada without scoring in the second ball of the Ireland innings and the visitors crumbled despite some stubborn resistance from O'Brien and Stirling. Off-spinner Duminy completed a good all-round day by taking career best bowling figures.